Exactly 1 year ago Felippe Massa suffered a career threatening injury. Today he suffered a significant psychological one as Ferrari gave him the order to stand down for the benefit of teammate Fernando Alsonso thus ending any aspirations the Brazilian may have had of competing for this years championship. On a weekend where Ferrari finally turned their pace to points the team order scandal somewhat overshadowed what was a thoroughly impressive turn of form for Ferrari. Going into this race they hadn't won since the season opener in Bahrain and were in desperate need of a boost. 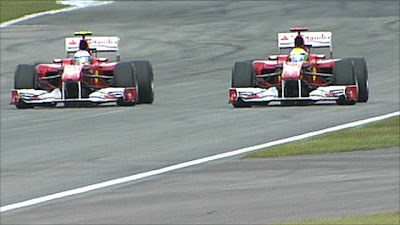 At the start both Ferraris kerfuffled Vettel enough to steal 1st and 2nd off the line and hold position till the flag. Massa seemed at last to have got to grips, literally, with this years tyres but once he switched to the harder compound things seemed to unravel fast. With Massa now struggling with the new tyres and his teammate Alsonso steadily falling into target range for 3rd placed Vettel Ferrari gave the call to let Alsonso through on Lap 49. Ferrari were fined $100,000 for the coded order to let Massa through although today's result will be unaffected. Smedley, Massa's race engineeer, told him his gesture was "magnanimous" but Massa's body language suggested that magnanimity is usually a voluntary act. And the obligation to have a podium celebration simply compounded the icy atmosphere clasping the Ferrari garage. When asked about the incident at press conference Massa said everything whilst only saying these acid tinged words; "he passed me... we're working for the team". And so it goes on, first Red Bull get their teammates sniping at each other and now Ferrari and you can bet McLaren's wholesome pally pally image will soon face scrutiny on the track as well. In the end Vettel didn't challenge the Ferraris and secured third spot for Red Bull with Webber coming home a subdued 6th. McLaren will be quietly content with their 4th and 5th places which keeps them aloft in both Championships. On a day when the top performers were doing the business of wrapping up points Mercedes failed to impress on home soil by failing to score any. Although on this occasion Shcumacher and his teammate finished next to each other suggesting it may be the car itself that's causing the problems after all. Also of note were the junior Red Bull's who managed to imitate their seniors by crashing into each other on lap one. Christian Horner will be relieved he wasn't pestered about that one today. In fact the Red Bull principal seemed content to sit back and watch Ferrari Boss Domenicalli take a grilling by the BBC pundits instead of him. To be fair to Horner at least he is unequivocal when it comes to letting his drivers race each other. Although there are no team orders at Red Bull the favouritism shown to Vettel almost equates to the same thing. And so we move on to Hungary next week with the Championship table poised even sweeter now that Ferrari have turned their game back on. Whilst Massa may well feel hard done by today I'm sure he'd be genuinely pleased to see Alonso winning the title with Ferrari by the margin of 5 points which he sacrificed today.